What’s It About? Released in cinemas in June, Jonah Hill and Channing Tatum return as Schmidt and Jenko in the follow up to 2012’s surprisingly excellent 21 Jump Street. They’re now even more too-old for high school, so they’re sent to college to carry out the exact same mission as last time – they must ‘infiltrate the dealers, find the supplier’ of new drug ‘WHYPHY’ that’s circulating the campus. Verdict: The DVD case proudly sports 5-star reviews from both The Sunday Times and Zoo, and this is testament to how successful this comedy sequel is – if it can get such high praise from the two very different publications, it must be doing something right – and making £192million at the worldwide box office is further testament to that. Comedy sequels are very tough to pull off. But if there’s anyone that can do it, it’s directors Phil Lord and Chris Miller – the duo also behind The LEGO Movie, giving them a one-two punch this year that’s hard to top. Rarely before has a sequel been quite so self-aware. They just about stop short of singing ‘Sequel Song’ from Muppets Most Wanted, but don’t hold back on referencing the surprise success of the first project and the difficult second mission with a bigger budget. Despite the familiar (exactly the same) plot, it somehow manages to still feel fresh and exciting – certainly moreso than this year’s Let’s Be Cops, clearly greenlit after the success of the first Jump Street movie. The chemistry between the two leads is a joy to watch, and still the main selling point of the film. Both great actors individually (Hill now has two Oscar nominations and Tatum may well be amongst them himself next year thanks to Foxcatcher), they work so well together as a comedy double-act. Hill has a gift for facial expressions and body language – notably in his morning-after walk of shame scenes. Tatum is more of a straight man for a lot of the film, but is as dumb and goofy as ever. With the plot pretty much exactly the same as the first film, this time the roles are switched slightly and it’s Jenko who makes friends and enjoys the college lifestyle more than Schmidt. Despite the straighter role, it’s Jenko who gives us perhaps the funniest moment of the whole film, with a scene that sees Tatum’s physical comedy come to the fore. As well as the returns of Schmidt and Jenko, pretty much everybody else from the first film reappears – from Nick Offerman’s Deputy Chief Hardy, Mr Walters and Eric (Rob Riggle and Dave Franco – featured in the trailer but uncredited in the film, in perhaps the film’s weakest scene) to Schimdt’s parents and Jenko’s geeky friends. But it’s Ice Cube’s Captain Dickson whose role is significantly beefed up, and as a result he completely steals every scene he’s in. They’re also joined by Wyatt Russell, Jimmy Tatro and a very funny Jillian Bell – equipped with a wealth of age jokes to throw at Schmidt. The weakest part of the first film was its one real gross-out moment, but we don’t see any repeat of that here. This is a film with a lot of heart – perhaps even more so than the original, as we really buy into the relationship between the two undercover cops. It never goes down the route of thinking ‘mean’ equals funny, remaining good natured and silly, but very funny. It’s full of a mix of clever dialogue, visual gags, physical comedy and subtle humour. There’s also just about the right amount of action, giving Tatum the chance to show his impressive action chops (and apparent parkour skills). It’s never a good sign for one of the best bits of a film to be the closing credits, but here it’s not a criticism of the film itself but instead a celebration of just how funny the closing credits really are. Lord and Miller have spoken recently about continuing the journey of Jenko and Schmidt, and though we live in a world of endless sequels, it’d be a shame not to see more of the duo, as well as the rest of the cast and crew. 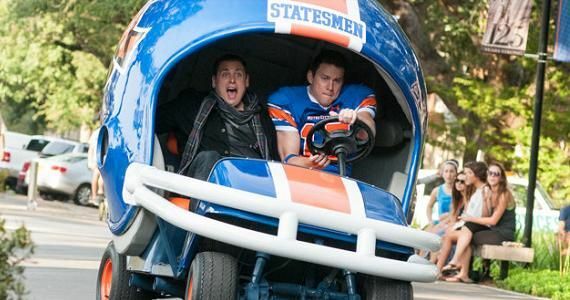 22 Jump Street isn’t quite as tight and focussed as the original (taking 15-20 minutes off the runtime would probably have helped), but the jokes come thick and fast so if your interest starts waning there’ll be something to make you laugh just around the corner. Extras: Fans not sure whether to buy this on DVD or Blu-ray should really plump for the latter, as there’s a whole wealth of Blu-ray-exclusive material. Both formats though include a really-quite-funny audio commentary of the movie from the directors and two leads, as well as the standard selection of deleted scenes and out-takes – some of which you’ll be glad didn’t make it into the final cut. Final Words: Captain Dickson’s line “do the same thing, and everybody’s happy” proves to be completely true here. Hill, Tatum and Ice Cube are all excellent. Funny throughout, it just about surpasses its predecessor, and is alongside Bad Neighbours the funniest film of the year – and a great stocking filler too. 22 Jump Street is out on Blu-ray/DVD from Monday 17th November.